Nature as Deity The idea of Nature as an object of veneration and worship is as old as man. Numerous religions and cultures have built upon this notion- even as some religions have evolved pagan roots are still evident. Tied into the worship of nature is the idea of the inter-connectedness of all things with none dominant over the other. As our society and world are facing an environmental crisis which may even lead to our demise it is more important than ever to understand this symbiotic relationship and embrace eco-psychology. 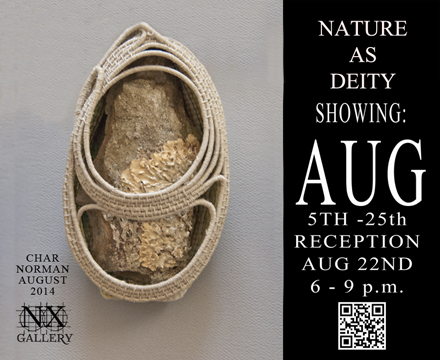 I present nature in sacred spaces and attitudes as a way to bring understanding and importance to the issues at hand. The work is created through a labor-intensive almost meditative process. The making of the paper is an act of worship and reconstruction of plant fibers; embedded within are healing herbs. The sewing of layers and natural elements to the surface references mending of worn or damaged goods as well as the nurturing action of women’s work. The many layers within each piece denote the layers of religious history from paganism to Etruscan to roman to contemporary Christianity. Just as these processes and materials are woven together, the interconnectedness and the sanctity of nature is reinforced.